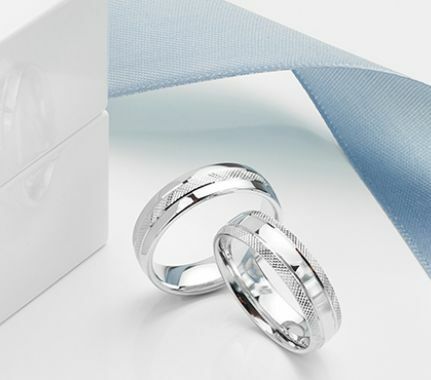 Discover a unique collection of patterned wedding rings for men and women. Crafted in many unusual styles, each patterned wedding band features individual design elements from laser engraving to machine patterns. Find the perfect wedding ring in a wide choice of metals including Platinum, 18ct Gold, Fairtrade Gold, Palladium, Titanium and Zirconium. Satin finish wedding ring with centralised double line detail machined around the circumference of optional wedding ring widths. Choice of 4mm, 5mm and 6mm widths. Flat court profile wedding ring with comfort fit and satin outer matte finish. Machined cut pattern by way of double lines extending around the ring. Available across other profiles in addition to this suggested option. Please allow 3 weeks for completion. Mens two colour wedding ring featuring a slight court design with 18ct White Gold central section and 18ct Yellow Gold mirror polished edges. 6.5mm wide men's wedding ring with polished edges. Medium weight design with a slight court profile and comfort fit. Brushed satin finish 18ct white gold with mirror polished 18ct yellow gold round edges. Hammered texture patterned wedding ring available in a wide range of width and metal combinations with unique hammered texture outer finish. A simple patterned wedding ring, with a detailed polished hammered outer finish and inner court profile. Available in most metal choices. Inner comfort fit. Various widths available. Approx. 3 weeks delivery depending on finger size, metal and width chosen. Distinctive satin finished wedding ring with a D shaped profile, machined with cut channel and contrasting inner mirror polish. D shaped ring profile with comfort fit. Machined central channel. Choice of widths and metals. Satin finish, polished channel. Available in 18ct Gold, and Platinum. Flat court wedding ring with satin outer finish and polished machined channel detail, available in many combinations for width and metal. Typically finished with a satin outer finish, to contrast the polished channel and inner surfaces, this flat court profile wedding ring has a modern sleek appearance. Most effective in widths over 3mm, a polished channel is machined along the centre of the ring for a distinctive look. Please allow 3 weeks for this wedding ring design. Unique 6mm concave, comfort fit patterned wedding band, with angular diamond cut detail in a medium weight profile. Unique concave wedding ring design, with polished angled cut patterns around this distinctive style of wedding ring. This pattern can also be applied to a flat court profile, and is available in other widths across a wide range of metal choices. The satin finish adds a wonderful contrasting effect to the polished cut pattern. Please allow 4 weeks for this ring design max. A medium weight slight court profile wedding ring, with criss-cross central pattern detail. Offered in a choice of ring widths. Choice of metals and widths. Unusual pattern. Can be combined with an optional satin finish where required. Timescale approx. 1-3 weeks depending on finger size, and metal required. Beautiful simple flat court men's wedding ring available in 4mm to 8mm widths with polished double line detail across a mirror polished surface. 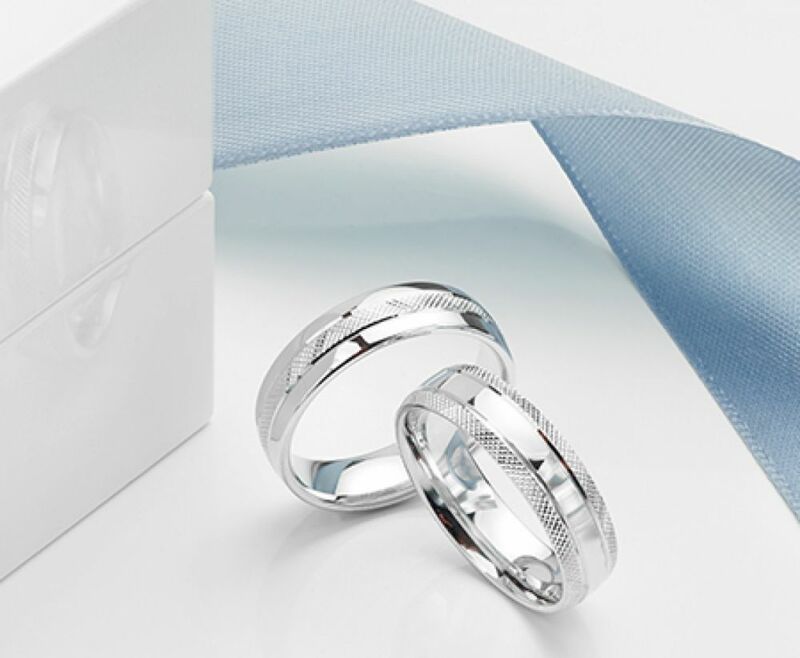 Offered across a wide range of metal alloys and ring widths, from 4mm to 8mm this attractive men's wedding ring has a flat court profile and distinctive sectioned appearance. Two machine polished lines are applied to the surface of the band before the ring is mirror polished for a stunning final result. Please allow 3 weeks for this ring design. Hammered pattern wedding ring for me, available in 4mm to 8mm ring widths in a range of precious metal alloys. A men's hammered finish wedding ring, with hammered pattern effect over a wide range of ring widths, including satin outer finish and comfort fit band. Timescale approx. 3 - 4 weeks for completion of this unique design in many metal alloys. Contemporary styled wedding ring. Medium weight court profile band with a central groove dividing a polished and satin finish. Uniquely styled, the tyre print patterned wedding ring adds an entirely new, personalised appearance to a court shaped wedding ring, available in a wide choice of precious metal options. Frosted textured effect wedding ring with mirror polished edges across a slight court shaped band. This distinctive style can be commissioned by selecting different precious metal, width and finger size options. A comfortable slight court wedding ring featuring mirror polished edges contrasting with a frost textured central band. With a substantial medium weight, this comfortable court shaped wedding ring features a cross-hatched pattern along the centre contrasting with a outer mirror polished edges. Boasting a perfect finish and intricate detail, this cross-hatch patterned wedding ring adds bold contrast to mirror polished edges for a completely unique look. A lightweight court profile patterned wedding ring with double line detail and contrasting finish in a medium weight design. Simple, lightweight court profile design. Patterned line detail. Satin outer finish. light weight design. Available in 18ct White Gold, 18ct Yellow Gold, Palladium and Platinum. Approx. 1 - 3 weeks delivery depending on width, metal and finger size. Flat court profile wedding ring with a medium weight, patterned with a milgrain central section with mirror polished finish. With choices of width between 4mm to 7mm, this flat court profile wedding ring is mirror polished with a central milgrain pattern applied centrally around the ring for a distinctive individual look. This pattern can be applied to other ring styles. Please refer to the cut number above when enquiring. Please allow 3 weeks for this design. A flat court profile ribbed patterned wedding ring with polished finish and inner comfort fit. Flat court ring profile. Horizontal line pattern with ribbed effect. Polished finish. Available in various widths from 4mm through to 8mm and a wide range of metal choices. Approx. 1-3 weeks for delivery. Satin finish medium weight court profile patterned wedding ring with incised machine cut double line. This attractive machined pattern and finish can be applied to any plain wedding ring, but here we have presented the finish across a court profile wedding ring, in 4mm, 5mm and 6mm width options. The ring has a substantial medium weight court profile with a subtle double line over a satin outer finish. Available in most metal choices. Please allow 3 weeks for this design. A simple medium weight court shape wedding ring with single offset line pattern. We would typically create this patterned wedding ring design with part satin finish and part mirror polish either side of the machine cut line detail. The ring can be created in many different widths, but here we have 4mm 5mm and 6mm choices. Medium patterned court wedding ring with machined edges and a brushed satin finish. Beautifully original patterned wedding ring with a satin outer finish. The edges of this wedding ring are machined to provide contrast to the rounded outer surface of the ring. We can create this design across any wedding ring, but here we have selected a medium weight court wedding ring in suggested 4mm, 5mm and 6mm widths in most metal choices. Please allow approx. 3 weeks for this ring design. Ridged pattern wedding ring available in a range of metals and widths, featuring a machine patterned ridge detail over a court profile band. Choose from a selection of widths - 4mm, 5mm and 6mm for this medium weight court profile wedding ring with machined ridged pattern and a mirror polished finish. Available across many other ring styles, this pattern adds a unique and personalised appearance to your wedding ring. Please allow a maximum of 3 weeks for this item. Satin finish traditional court wedding ring with machined double line over a satin outer finish. Attractive satin finished wedding ring with a rounded traditional court profile, featuring a contrasting double line pattern over the matte outer face of the wedding ring. We provide this design over most other profiles, but here across a medium weight traditional court wedding ring in suggested 4mm, 5mm and 6mm width options. The ring can be created in most metal choices including 950 Palladium. Flat Court Wedding Ring with half tramline pattern top and bottom edge. Beautiful design of patterned wedding ring. Ideal men's wedding ring available across many metal and width choices. Satin outer finish. Comfort fit inner finish. Central machined lines, etched into the satin finish exterior. Available in a wide range of widths and metal choices. Timescale can vary from 1-3 weeks. Unusual bevelled wedding ring with cross patterned detail over a satin finish with polished bevelled edges and flat court profile. Unusual men's patterned wedding ring featuring bevelled polished edges and satin outer finish with cross patterned lines, over various choices of metal and width combinations, including 4mm 5mm and 6mm width choices. Please allow around 3 weeks for this ring design. A court profile wedding ring with a satin finish and a Milgrain edge pattern. Attractive court profile wedding ring featuring a patterned milgrain edge on either side of a satin finished medium weight ring, available in a range of widths from 4mm to 6mm. Other sizes and options are available alongside a full choice of metal alloys to personalise this sophisticated design. Mirror polished court profile wedding ring with Milgrain edge detail and comfort fit. Available in 4mm, 5mm and 6mm width, this design can be fully customised for metal, width and finger size. The ring is beautifully mirror polished and includes a simple milgrain edge pattern around the medium weight court profile band. Please allow around 3 weeks for this ring design as a maximum timeframe. With exceptional impact, this wonderfully comfortable court shaped wedding ring features stylish edges textured with a machined cross-hatched pattern alongside a mirror polished central section. Created in a choice of widths, the edges to this medium weight wedding ring are machine textured with a cross-hatched pattern contrasting superbly with the high polish of the middle section of the ring.